If you can’t watch the news, but you still like political stories, you can always pick up a novel. These three books will help you escape into the safe world of political fiction. One all-American story, a smart romance and a clever mystery. In 1971, Henry Bonwiller is near the front of the race to become the next Democratic nominee for president of the United States, and a young Corey Sifter is there to witness his rise and ultimate fall, as an aide to the money and power behind the campaign. Politics are tough and public image is everything for United States Senator Patrick Malendar of California. He’s up for re-election and his young Republican opponent is giving him a run for his money. This modern romance is full of fun banter and romantic tension. But it also tackles many serious subjects, including the price of public life, family secrets and infidelity. Why not write a mystery with Barack Obama and Joe Biden as amateur detectives? This pair has plenty of rapport to wrap around a good story line. Who better to solve a mystery than the former President and Vice President of the United States? Imagine a scenario in which ridiculous characters bumble through a series of hilarious coincidences and an equal number of snafus, all in the name of love, marriage and a big business deal. The first of three short novels included in Just Enough Jeeves, a fun introduction to P.G. 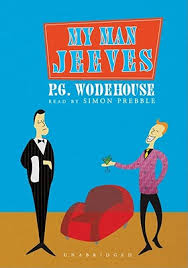 Wodehouse’s famous characters: twenty-something Bertie Wooster and his manservant Jeeves. Andrew Shaffer had a very funny idea. Why not write a mystery with Barack Obama and Joe Biden as amateur detectives? If you’ve ever seen some of the Obama-Biden “bromance” memes (click here for a few), you’ll know this pair has plenty of rapport to wrap around a good story line. Who better to solve a mystery than the former President and Vice President of the United States? The story begins soon after the 2016 election. Obama has adjusted nicely to a new life filled with adventure. He’s windsurfing, kayaking and hanging out with celebrities. But Biden is at loose ends and is a little stung by Obama’s new life and friends. “Why doesn’t Barack ever call me, his best friend?” he wonders. The pair reconnects when Biden’s favorite train conductor dies under suspicious circumstances. “Amtrak Joe” senses there is more to the story. Biden has been a regular on Amtrak for decades and he knows that Finn Donnelly was a good, family man. But questions arise when Obama shares what police know. Could there be a national security interest at stake? Is Donnelly’s death connected to opioid trafficking? Biden takes the lead and jumps straight into the case in his full-force, pantser style. And before long, Obama and his cool and calm self are part of the team. As the pair bumbles through their undercover investigation, in caps and shades, it becomes clear that this case is big and that not everyone is on the same team. Can the Obama-Biden team sort it out? I thoroughly enjoyed imagining Obama and Biden as they adjust to their new lives as regular citizens. And seeing them operate as amateur detectives makes for many hilarious scenarios. Shady characters and a few false leads make the mystery an enjoyable puzzle to solve and, while the crimes and consequences reflect grim problems, the story is light and great fun to read. I recommend Hope Never Dies to all readers. It is pure entertainment, with a few political jabs and a lot of laughs. I received a copy of Hope Never Dies from NetGalley in exchange for an honest review. I read Hope Never Dies as part of my library’s Summer Reading Challenge to choose a book because I like its cover. Kurt Vonnegut (1922 – 2007) was an American author and humorist, well known for his use of black humor and satire. Over a period of more than 50 years, he published fourteen novels, three short-story collections, five plays and five works of non-fiction. 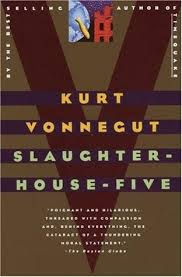 Slaughterhouse-Five was his sixth book, published in 1969, during the Vietnam War. It became his most famous book. Vonnegut was born in Indianapolis, Indiana. He was the youngest of three children and his grandparents on both sides were German immigrants. Because of the anti-German sentiment in America during World War I, however, the Vonneguts gave up their German heritage. Vonnegut’s father was an architect and his mother came from one of the wealthiest families in Indianapolis, owners of a brewery. The Great Depression hit the Vonneguts hard. His father had to give up his architectural business and they sold the family home. His father tried his hand at painting and his mother wrote for magazines. During these years, his mother became addicted to alcohol and prescription drugs. Vonnegut attended Cornell University in 1940 where he studied biochemistry. He did not enjoy studying and received poor grades. He had already begun his writing career, however and was editor of the school newspaper. Soon after the attack on Pearl Harbor, Vonnegut wrote a satirical article in the school paper. As a result, he was kicked out of the Reserve Officers’ Training Corps and put on academic probation. Soon after, he dropped out of Cornell and joined the Army as a private. In 1944, Vonnegut was captured by the Germans and was sent to Dresden, where he lived in a slaughterhouse and worked in a factory. When the Allied forces bombed Dresden in 1945, Vonnegut survived by hiding in an underground meat locker. Vonnegut’s experience at Dresden affected him deeply and Slaughterhouse-Five is a reflection of this experience. After the war, Vonnegut attended the University of Chicago and studied anthropology, but he did not earn a degree. He also worked as a publicist for General Electric and wrote on the side. He quit GE in 1952 to write full-time and his first novel, Player Piano, was published that year. His work also appeared in Collier’s, The Saturday Evening Post and Cosmopolitan. 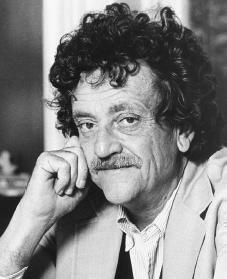 Early in his career, Vonnegut also worked as an English teacher, a copy writer for an ad agency. He and his wife Jane had three children and then adopted Vonnegut’s sister’s children after his sister and her husband died. Later, Vonnegut spent nearly two years teaching at the writer’s workshop at the University of Iowa. In 1967 he won a Guggenheim Fellowship for research in Germany and traveled to Eastern Europe, including Dresden. He integrated his writings about World War II into the book that became Slaughterhouse-Five. Slaughterhouse-Five sent Vonnegut’s career to new heights. He soon became a regular commencement speaker, lectured at Harvard, taught at City University of New York and received many honorary degrees. And he continued to write. Vonnegut’s marriage to Jane ended in divorce in 1971 and in 1979 he married Jill Krementz, a photographer. In his later years, Vonnegut was an outspoken supporter of several causes: preserving Constitutional freedoms, nuclear arms control and protection of the environment. He wrote throughout his life and died in 2007, at age 84. The Paris Review – The Art of Fiction No. 64 – a compilation of four interviews. Visit The Strongest Librarian for A Complete List of Kurt Vonnegut Books. I have a plan, sir, which I fancy may produce satisfactory results. These words are music to Bertie Wooster’s ears in the second selection of books from Just Enough Jeeves, by P. G. Wodehouse. 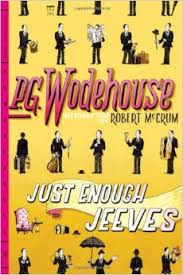 Very Good, Jeeves is a collection of eleven stories in which Bertie Wooster finds himself caught in a variety of tight spots and is invariably saved by his faithful manservant, Jeeves. In these stories, Bertie fancies he has the same problem-solving expertise as Jeeves. His solutions to a variety of situations, such as enacting revenge on his boyhood pal, Tuppy Glossop, wriggling out of the clutches of his controlling Aunt Agatha, or saving Bingo Little’s marriage, fall short in logic and execution and Jeeves is always at the ready to save the day or arrange for a quick escape. Sometimes Bertie is a nettled that no one takes him seriously, including Jeeves. Sometimes Jeeves is piqued that Bertie goes against his advice, but their amusing back and forths during the situation of the moment lead each story to a happy finish. And in the end, an ever-grateful Bertie always gives brainy Jeeves due credit. You know, whatever you may say against old Jeeves – and I, for one have never wavered in my opinion that his views on shirts for evening wear are hidebound and reactionary to a degree – you’ve got to admit that the man can plan a campaign. Napoleon could have taken his correspondence course. Very Good, Jeeves is another wonderful escape into the silly world of the upper class English, poking fun in just the right way. Two of Wodehouse’s best-known characters are the bumbling Bertie Wooster and his ever-wise manservant, Jeeves, who is always at the ready to rescue Bertie from a wide variety of social disasters. These stories make me laugh out loud and are just right for summertime reading. P.G. Wodehouse (1881-1975) was a very successful English writer whose career spanned decades. His life, however, was not always easy nor without controversy. Check back soon for a post about Wodehouse and his life. Just got it on my Kindle and I’m ready to go! Check back in a few days for my review. 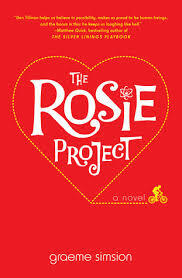 Graeme Simsion is an Australian writer of screenplays, plays, short stories and novels. He is also a former IT consultant, specializing in data modeling. If a bump on the head causes you to forget the last ten years of your life, can you make some changes before those memories return? It’s an interesting concept and similar to the ideas expressed in Life After Life by Kate Atkinson and The Impossible Lives of Greta Wells by Andrew Sean Greer, in which characters try to get things right in alternate lives. In What Alice Forgot, Alice Love knocks her head at the gym and wakes up thinking she is ten years younger and pregnant with her first child. Much has changed in Alice’s life, however, and many problems loom. This story is a light, feel-good read, set in suburban Australia. When she awakens, Alice learns that her marriage has crumbled and discovers that, in the past ten years, her own personality has undergone a dramatic change. Her easy and happy ways have been replaced by a drive and aggression she can hardly recognize. Her husband Nick has moved out. Her oldest daughter is angry and having problems at school. As the circle widens, Alice realizes that she and her sister, Elisabeth are barely speaking and her best friend, Gina is dead. In addition, she wonders how she can be friends with the other “power women” in the community. Alice sees all this through her younger, carefree eyes and struggles to understand. Alice’s younger personality starts to fix some of the problems, and there’s hope her marriage can be saved. As the anger between Alice and Nick recedes, Nick worries that the modern Alice will return and all will be lost. He’s sure he will know by the look in her eye which Alice he’s seeing. At the same time, Moriarty introduces the parallel stories of Elisabeth and Alice’s “adopted” grandmother, Franny. Interesting memory triggers, particularly the sense of smell, cause Alice to remember painful events. Moriarty threads the themes of love, marriage, parenthood and family through these side stories. The plot is well-constructed, and keeps the reader interested in what will happen when Alice’s memory returns. A crazy giant lemon meringue pie-making event somehow works to bring the story to an upbeat and happy conclusion, with a few surprises. 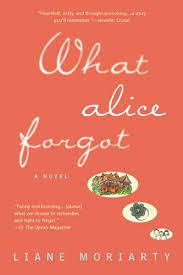 If you are looking for an entertaining read, check out What Alice Forgot. While not too weighty, it’s fun and enjoyable. For more Moriarty, check out my audiobook review of Truly Madly Guilty. This made me laugh so hard – hope you enjoy it too! Yesterday, I spent 20 minutes clicking my way deeper and deeper into a company’s website, looking for someone’s email address. Unless you’re looking for an incredibly specific, possibly illegal item that’s only sold by a tiny curio shop in the Ukraine, that’s a stupid amount of time to spend looking for anything online. I was determined to find the address or die trying, though, because my only other option was calling her. Yep. I had her phone number the whole time. When it comes down to it, I would rather fly a rickety, snake-infested plane to the Ukraine to hunt down an incredibly specific, possibly illegal item that’s only sold by a tiny curio shop there than pick up the phone and call someone. My Man Jeeves is still funny! These early P.G. Wodehouse stories are very funny! I read them in college and just had to read them again. I remember laughing on the subway reading these the first time. This time I laughed out loud in a doctor’s office. Also included are some stories that do not include Jeeves. They are amusing, but not as polished and a little slow. Some of the funny lines and phrases recur in multiple stories.